BONNEY LAKE, Wash. (AP) — Every time Chris Gilman leaves her home at the foot of Washington’s Mount Rainier, she fights the gnawing urge to turn around and check that someone isn’t about to shoot her. Sometimes she wins the battle. Sometimes she loses. In the year since the 48-year-old was nearly killed in the worst mass shooting in modern U.S. history, Gilman has had to get used to living with fear: She has nightmares about family members getting shot, she only sits in spots in restaurants where she can see the exits, and she has to mentally prepare herself for movies that might include rapid gunfire. And then there are crowds, the toughest new obstacle Gilman must brave since surviving the Oct. 1, 2017, massacre in Las Vegas, which killed 58 people and wounded hundreds of others. Gilman was shot in the back; the bullet punctured a lung, lacerated her spleen and a kidney, broke two ribs and lodged 2 millimeters from her spinal cord. That feeling turned into panic at one of Gilman’s first concerts since the shooting. Gilman and her wife of 18 years, Aliza Correa, were with friends at Seattle’s KeyArena following an Aug. 11 concert when the surge of people around them became overwhelming. “I was hyperventilating, and I ended up laying on the ground,” said Gilman. Correa is struggling with her own trauma. She was at the Route 91 Harvest Festival in Vegas with Gilman when a lone gunman busted out the windows of his 32nd-floor hotel room and launched an 11-minute barraged of gunfire on the crowd below. The women were helping a wounded friend when the bullet tore through Gilman. Gilman laid down and told Correa to save herself. Correa refused to leave her side. “I said, ‘If you die, I die, so if you don’t want me to die, you have to get up,” Correa said, recounting how she rolled Gilman over so her injured wife could Army-crawl for cover under some bleachers. From there, Gilman said she knew she couldn’t go any farther. That’s when two married off-duty Los Angeles County sheriff’s deputies, Alex and Wanda Valiente, came upon the couple. The Valientes and Correa wouldn’t budge. Gilman did just that, and the Valientes helped carry her to a car as bullets continued flying around them. Correa tried to clear a path for them amid a sea of wounded people, bodies and chaos. They made it. Out of the chaos, to the hospital and eventually, back home to the idyllic community of Bonney Lake, an hour southeast of Seattle. Gilman and Correa live in a recently developed, well-kept and tight-knit community that borders between suburban and rural, offering crisp mountain air and lots of grassy open spaces. But coming home was just the beginning. Correa, an ultrasound technologist, recently stopped working with patients needing the scans, often used to find the sources of an illness. Watching someone quietly weep as their mind races through the possibility of a life-threatening condition became unbearable. Gilman is often on high alert, even on her front porch. In casual conversation, her hazel eyes dart between the person she’s talking to and her surroundings — from neighbors walking their dogs and the children playing in the street to the garbage truck passing by. There are many dark moments that remind them of things they can’t forget. The physical nerve pain Gilman feels when Correa affectionately puts her arm on Gilman’s hip out of habit. And though she has largely recovered and even had the bullet removed from her body in a subsequent surgery, she proceeds gingerly when she has to bend down and is frustrated that she struggles to exercise like she used to at the gym. Amid the struggle, the couple strives for normalcy, for experiences most people can enjoy without a second thought. Though they weren’t regular concertgoers before the shooting, Gilman and Correa force themselves to get out in large, busy gatherings to face their fears. They also made themselves return to Vegas last month for a previously planned trip for Correa’s mother’s 70th birthday, a journey that induced panic for Gilman but became therapeutic by the end of the weekend. 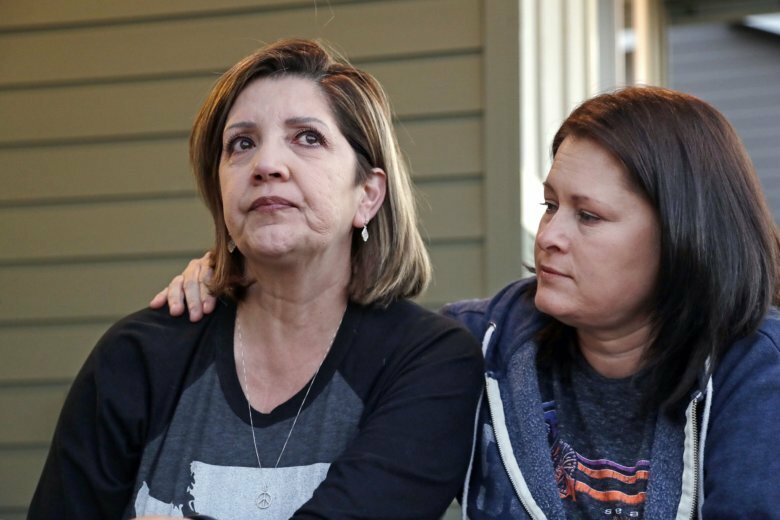 Gilman and Correa try to focus on what they’re thankful for: each other, their friends and family, and the new relationships they’ve developed as a result of the shooting. The Valientes, the off-duty sheriff’s deputies who helped save Gilman’s life, have become like family. The group got separated the night of the shooting and it took Gilman about a month to find them. She tracked them down on a Facebook page created to help survivors find the people who helped them, and vice versa. The two couples got together at Christmas and plan to see each other again in October. For now, Gilman and Correa will keep trying, keep putting themselves in uncomfortable situations, and eventually, they hope, live with a little less fear. Follow AP’s coverage of the Las Vegas mass shooting here: https://apnews.com/tag/LasVegasmassshooting .